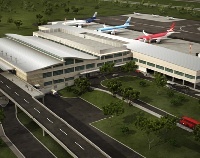 Quito’s new international airport is scheduled to open in October of this year. Located in Tababela, northeast of the city, this new airport is being constructed using earthquake-resistant techniques and materials. The government is pinning its hopes on the airport’s ability to turn Quito and, by extension, Ecuador, into a regional tourism and commerce hub. Manuela Séaenz (1797-1856) was a “sentimental friend” to Simón Bolivar. Eugenio Espejo (1747-1795) was Quito’s first journalist (and hygienist). Carlos de Montúfar (1780-1816) was an Ecuadorean military hero. Hmmm... I still like the first option best, but feel more informed now. Also, I can’t decide whether Montúfar’s last name (mont-TOO-far) is a great or terrible moniker for an airport. Your take? P.S. All interested parties are invited to vote before April 30th at nombrenuevoaeropuerto.com.